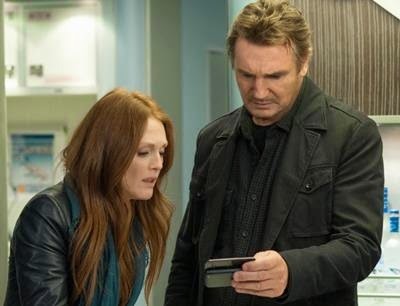 When I pulled up Non-Stop starring Liam Neeson, I was not holding my breath. I pulled up the movie on my VoD to kill some time. But what I didn't expect was to be fully entertained by this flick. The story of Non-Stop is about an air marshal assigned to a transatlantic flight who starts getting death threats (against the passengers), unless $150 million is put into a specific off-shore account. The marshal gets these threats on a secure phone via text messages. The threat says that a passenger will die very 20 minutes until the black mailer gets his money. The movie starts out showing us that marshal Marks has a few personal issues, but is carrying out his job dutifully. He's friendly with the air crew and as he settles into his seat, we also learn how much he hates flying. As the passengers are seated, we see and meet various other folks. Folks that seem suspicious or maybe not. They all have potential and they all could be innocent of what we know of the plot. What ensues is a fairly inventive process of exactly how the black mailer pulls off his threats and the ensuing actions and redirects in the story are mostly, fairly engaging. I found myself being mystified and surprised from one moment to the next as the plot unfolded. And I was pretty entertained. So how can you pull off a blackmail plot on a tube with a finite number of people? Director Jaume Collet-Serra (Unknown, Orphan) figured it out. Unknown and especially Orphan, are pretty fun and good movies. Other cast includes Julianne Moore, Lupita Nyong'o, Scoot McNairy, Michelle Dockery, Anson Mount and other known faces. Non-Stop is a worthy rental for sure, and if you're a Liam Neeson fan, I think it would be a worthy addition to your Neeson collection. I completely concur with the IMDb user rating of 7 for this movie, giving it a popcorn-7 score.